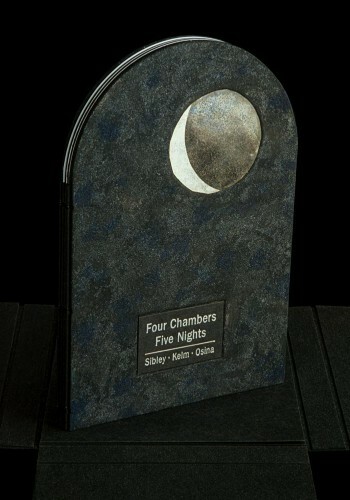 Four Chambers Five Nights is a collaboration among Daniel Kelm, Joseph Osina, Suzanne Moore, and myself. The boards for this handmade limited edition were covered with ultrasuede and painted. Carborundum was added for sparkle. The moon is a patinated silver disk, hammered by yours truly. The moon is a good metaphor for the process of collaboration. It is important to become new together, to empty of expectations and preconceived notions, to enter the unknown, the dark. Only then do we begin to practice our craft. Inspiration gradually illumines the dark, empty field of space, and a shared vocabulary of words, materials, shapes, color, and light is discovered.